Mix 1/4 cup sugar and 1-1/2 cups water to 1 colour drink mix in 2-cup liquid measuring cup or small bowl; pour into ice cube tray. 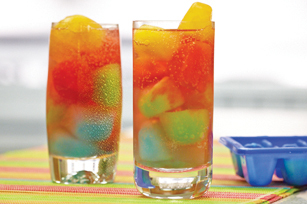 Repeat with remaining drink mix colours, 1 at a time, and using additional ice cube trays as needed. Add ice cubes to large glasses just before serving. Fill with soda. Look for inexpensive ice cube trays in discount stores. Store leftover drink mixes in separate airtight containers at room temperature. Sprinkle over scoops of vanilla ice cream, or use to flavour your favourite fruit smoothie.